What was your initial reaction to a novel involving such formidable real-life figures, Martha Gellhorn and Ernest Hemingway, and how Paula McLain added new dimensions to their marriage, fascinating lives, and the turbulent times? I love history and have always adored fiction set in a historical context, way back to when I read everything from Jane Austen to The Agony and the Ecstasy and Gone with the Wind as a teenager. As a young reader and still today I love the way historical fiction takes me to and teaches me about a time and place that I would otherwise never know. Having edited quite a few such novels by this point, I realize what a fine balance it is for an author to make use of the historical and biographical realities, but not to rely on them to the extent that the novel gets that, “And then this happened, and then this…” quality. The novel has to break free of chronological bonds and establish its own narrative arc, and that means dwelling on some of the characters’ life events—their family, their lovers, their work– and completely cutting out others. As for my initial reaction to the characters of Gellhorn and Hemingway, in this case I was well prepared for a Hemingway marriage, thanks to having been Paula’s editor for The Paris Wife, a novel about Ernest’s relationship with his first wife Hadley. But talking of turbulent times, LOVE AND RUIN has a vivid background that encompasses the Spanish Civil War, World War II, Cuba, Finland and China, so there is no shortage of action in this story! So Paula didn’t need to worry about adding new dimensions—they were already there in spades. How would you describe the editorial process while working with the author on this book? As any editor will tell you, it’s a very different process working with an author on a second or third book than first time around. Dare I compare it, when it works, to a no-longer new marriage that is the happier for its relative predictability? Working with an author the first time around you’re more hands-off, and the author too is less sure about what you want and expect. By book #3, which is the case for LOVE AND RUIN, I edit frankly, confident that this author knows how much I love and am committed to her work and that we’re totally on the same team, no matter what particulars we might disagree on. 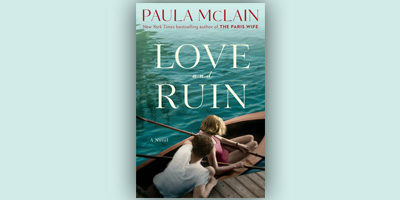 While LOVE AND RUIN is historical fiction, it feels genuine and true. What elements of the novel do you feel will resonate most strongly with today’s readers? In addition to the colorful settings of this story, which transport the reader to some fascinating places and events, I would say the two aspects of the novel that will most resonate with today’s readers are first, Martha’s decision to start an affair with Ernest, against her better judgement. Most of us have done just that, intentionally ignoring the warning signals that our brain is trying to tell us! And second, when Martha finds herself in the all too common dilemma faced by women then and now: should she let her career and her own life’s ambitions take a back-seat to her relationship with the man she loves? Check out Paula McLain’s national book tour appearances here.